The glycemic index of foods can be very helpful when used for preparing meals. Since most people do not prepare a meal using only one food it is important to understand the interaction of food combining. foods it can also help to prevent blood sugar raising, much like the effects of fiber. Vinegar has also been found to inhibit the digestion of starches. For example starting your dinner with a salad dressed in italian dressing (fiber + fat + vinegar) will lessen the impact of high glycemic foods in the meal. 1. Eat Fruit Alone– fruit contains sugars that are ready for the body to utilize and provides its own enzymes so it does not need much time to be digested in the stomach. It should not be combined with other foods and should not be consumed for several hours after eating protein or starch. If you have fruit following a meal the sugar in the fruit will ferment in the stomach, causing bloating and gas. Allow 1-2 hours before eating any other food if you do eat fruit. The best time is to eat it in the morning because then you know all other foods have been digested. 2. Do Not Combine Protein and Starch-they require different digestive juices in order to be broken down and used by the body. Digestion of starches begins in the mouth with the enzyme ptyalin, which is found in your saliva. Proteins are broken down in the stomach by hydrochloric acid and pepsin enzyme. Protein needs an acidic environment and starch an alkaline environment. 3. Eat Protein Alone or with Vegetables-Veggies are high in water content and relatively easy to digest. They can be broken down in either an acidic or alkaline environment so they can be combined with either proteins or starches. The enzymes in veggies actually enhance the digestion protein. 4. 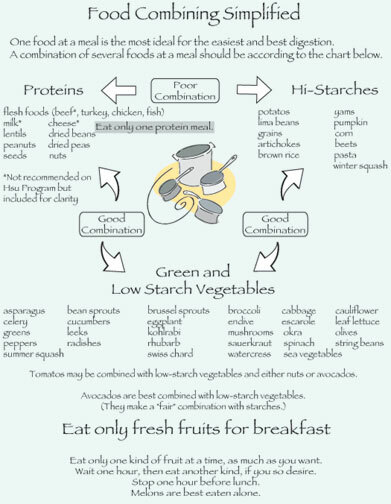 If You Eat Starches, Eat Them Alone or with Vegetables- Vegetables do not require their own specific digestive juices, so they can be digested in the alkaline environment required by starches. 5. Do NOT Drink with Meals– this dilutes the digestive juices that are needed to break down the food, preventing it from being properly digested. The best time to drink fluids is in between meals-at least a half and hour before or after eating. If you find you are thirsty after eating, you may be using too much salt in your food. Great information I was always wondering about this and this article really help to create clarity on topic. Thank you for providing your charts “Food Combining”. This is most helpful. You are very welcome. We are so happy you stopped by and are glad to have been a resource you could utilize. Have a wonderful day and week. Wishing you great love, health & abundant happiness today and always! Thank you so much for joining us here we are so glad we could be of help. We look forward to having you back and continuing to provide great useful information. Have a lovely day and week. Wishing you Great LOVE, HEALTH & ABUNDANT HAPPINESS Today & Always! P.s. Very true on the juicer and blender knowing is half the battle, and combining them right is wonderful to reap the highest and greatest benefits. We are glad you have arrived. Take care. I see a lot of people blending greens with apples (to get the sweet taste) or adding lemon to their juices when juicing. But according to your chart (I think?) that would be like mixing fruits with veggies which isn’t recommended for optimum digestion. Is this correct? What would you recommend to offset the bitter flavor of some of the juices when juicing only veggies? 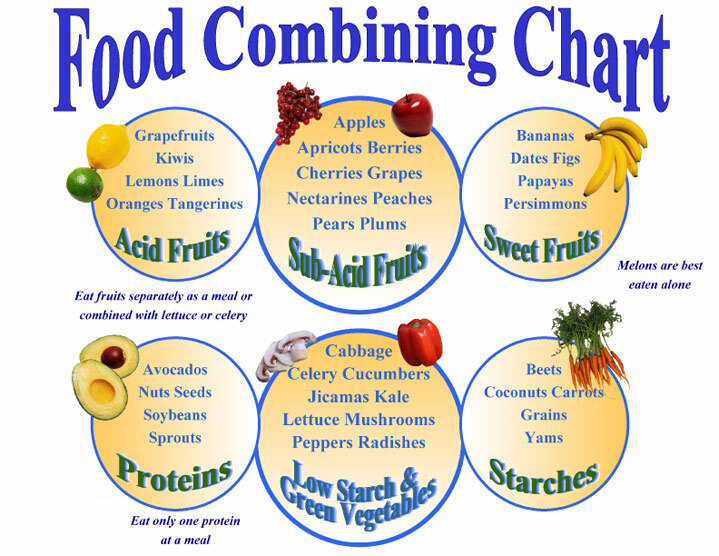 It is true that optimally for digestion combining fruit and veggies is not recommended. What I do most of the time is add carrots. They seem to add a nice sweet taste while countering the bitterness often associated with juiced veggies. I also like to use beets which seem to have that same sweetness to balance the veggies out. My favorite though…. is using apples. Hope this helps. Any other questions, please do not hesitate to ask. We really appreciate you visiting us and hope that you will be back again soon. Take care. Thank you for all of the helpful information. Since peanuts are a protein and a starch, what are they best combined with? They are best combined with vegetables. Thank you so much for your visit we do appreciate you. Have a wonderful day and week. Wishing you great love, health and abundant happiness this day and always! 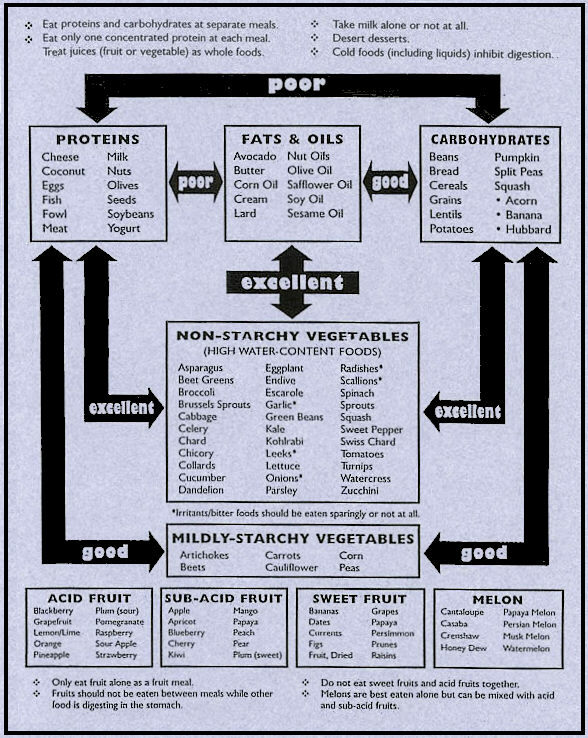 Hello…this food-combining data is information I have never before come across (OK, I live in a hole). Where did you source this info? I have been breaking all these “rules” all my life and–at 50–seem to be in good health. My typical daily breakfast combines un-sweetened plain yogurt, various fruits of various acidities, raw nuts (usually almonds), and granola (with all or most ingredients organic). With it, I drink a couple cups of regular coffee. I feel great now… am I slowly killing myself? Will I someday drop dead of a bad-food-mix induced disease? In all seriousness, I am seeking to make consistently good decisions about what & how I eat, but it seems impossible to find consistent info on what is truly good for one’s health… Could it be that some people digest stuff better than others? What would be the primary noticeable physical indicators of poor digestion and ultimately poor overall health? Thank you for your compassionate approach! Hello, I wanted to first and foremost thank you for arriving at our site. We are thrilled to have you here. I really believe that the individual is so different. One persons perfect is anothers poison. I believe in the bio-individuality and uniqueness with you. If you are not having any adverse reactions, affects, weight gain, and you feel great with high energy and your health and weight are in check as well as your fats then you may just fine. Food Combining as any other dietary theory is just that a theory. There are hundreds of these I know and what I can say is they all work differently for different people. As one of the Board Certified Health Coaches for Attracting Wellness answering health and wellness related questions we are so glad you so bodly stepped forth to ask. We have found in practice, with polls and other that everyone may have different variations of digestion based on age, damage, diet type, genes, etc. What about time between meals? I see the deal about separating one kind of fruit from another by an hour, etc. But with proteins and fats taking 12 hours to digest, you must have to eat before they’re fully digested. Otherwise you’d only have time for two meals a day. Thanks! Oh — and I forgot to ask if this is supposed to be helpful for weight loss. I’m guessing that’s one of its perks.